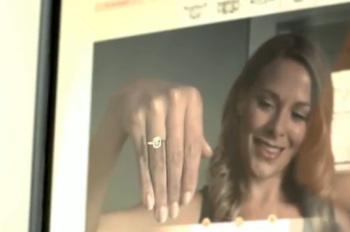 DeBeers, Tag Heuer and other high-end retailers have AR apps that let people try on diamonds and watches without touching them. My favorite technology — augmented reality, or AR — lets anybody feel like Harry Potter, except that you make magic with a computer or mobile device instead of a wand. I call it “real life, only better” because it takes a live scene and puts useful or entertaining images, video, graphics — whatever — on top of it. When I first wrote about AR last year, it was catching on, but hadn’t gone mainstream. Since then, better hardware and software have boosted its use in a number of industries, including retailing and marketing. Check out the faces of the startled visitors to London’s Victoria Station earlier this year when they stumbled into an AR happening for Lynx body spray. A few days before Thanksgiving, I turned on a network morning show to see Disney using augmented reality to let people interact and pose for photos with their favorite animated characters on a big screen in Times Square. But it doesn’t always have to be a “big screen” production. Lego has kiosks in its stores that give people a 3-D view of how toys would look once they’re assembled. All the shopper has to do is hold a (sometimes heavy) box in front of a humble yellow kiosk. A hidden camera scans a design on the box’s exterior, and the assembled toy — complete with animated characters — appears on-screen from all angles. Here’s what my son and I shot at a nearby Lego store. Check out Darth Vader’s sword fight. Lego Augmented Reality Death Star from Terri Thornton on Vimeo. It’s also enhanced virtual shopping. As you know, it’s one thing to look at something online, and another to see how it would actually look on you. DeBeers, Tag Heuer and other high-end retailers have AR apps that let people try on diamonds and watches without touching them. The drawback for online home-shopping apps is that they don’t work as well, or at all, on older desktops or laptops. They also require webcams. But as people buy newer, more powerful computers, mobile devices, and tablets like the iPad 2, more and more people will tap into the technology at home and on the go. Volkswagen counted on the growing interest in AR — and the popularity of mobile devices — when it rolled out the 2012 Beetle in Canada. Dr. Blair MacIntyre, who heads the Augmented Environments Lab at Georgia Tech, sees a day when augmented reality will be built into mobile browsers. Georgia Tech has developed an AR browser called Argon, which developers can customize for a number of location-based uses, ranging from tourism to real estate. “In the long term, we hope that much of the low-level capabilities we are developing now in Argon will move into the standard web browser, and that Argon will continue to push the boundaries of AR capabilities at a higher level,” MacIntyre said.